…the foundation of the Maze. Deep underground stones had been carved and fitted; passages opened in the natural rock. “Do you know what signs?” I asked him. It was surprising that he could identify any of the symbols, but I was relieved that he couldn’t read them correctly. The only other place I’ve seen the symbols on the wall is in room 1. In both rooms they seem to serve no other purpose than to hide a rotated message. I wonder if they have any other significance. Maybe wherever they appear, they simply signify that a message in rotated letters can be found. So far I don’t see any symbols in common between room 1 and room 40, although I may have missed an elusive link. Neither do they appear to be from any actual alphabet. Near the center to the page, on the bottom left-ish side, there is a long and slender oval opening alongside the cliff path, correct? In the bottom of the oval there appears to be a door or entrance of some sort (the black rectangle). Now, I could be wrong and maybe it’s just a random black rectangle that looks like a door, but to me it resembles an entrance of some sort too specifically for it to be random. It doesn’t have any numbers or any way to ‘navigate’ to attached to it, but it’s been bothering me every time I come across this page. It looks like an open entrance of some sort, off in the distance. I don’t remember seeing any open entrances throughout this book that you COULDN’T go through. Any thoughts? ***I meant lower right corner, not left. As of now, I just want confirmation as to the fact that it actually is an entrance of some sort, not just a mistake of the eyes on my part. Yes, it’s a door. It is the unmarked door from Room 29. Room 6 and Room 9 are a few other examples of rooms with open doors that are unmarked and therefore untraversable. The really baffling part is all the closed doors that you CAN walk through. What are we, ghosts? Ahhhh, it’s the unmarked door from 29? Could either of you provide the reasoning for that? I’m curious; it looks closed from room 29 but it certainly looks open from here? Manson was careful to correlate the number of doors in a room to the number of connections to that room, whether two-way or one-way. Most of the time, there is no obvious connection between how the connecting doors in rooms appear (open vs closed, arch vs standard door, etc). For example, compare the doors from room 26 to 36, 4 to 15, and many, many others. 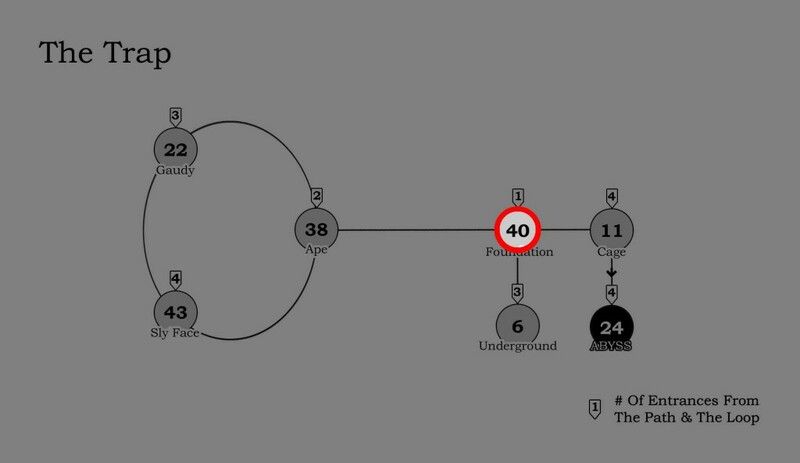 There are a few exceptions, in which the doors are obviously connected in some way, such as the slide from 41 to 38, the tunnel from 27 to 9 (or from 9 to 27, depending on the theory you ascribe to) and possibly the ladder from 41 to 35. Maybe a few more I’m not thinking of? You have discovered one of my favourite aspects of Maze, which is that you can spend a lot of time imagining what exists between the doors. Sometimes we get a sense, as in when the visitors pass “down a long flight of stairs, through some sort of pantry” as they leave Room 3, but usually it is left up to the reader’s imagination. An extended riff on what might exist between rooms in a Maze-like environment can be found in the mysterious novel Eidophusikon (available on Amazon and wherever else fine e-books are sold). At about twenty minutes into the “Primitive Signs” episode of MazeCast (concerning rooms 38 and 40), I argue something similar, though without the notion of turning the page sideways. That is, that the key depicted in Room 38 relates not exactly to the overall layout of the Trap but to the layouts of 38 and 40 in particular. I think it’s hard to deny the intuitive appeal of seeing the shape of a key in those rooms, but the handle of the key in 38 is too problematic for me to accept as a representation of the 3-room loop of 38, 22, and 43. YOUR MILEAGE MAY VARY, but I’m with you in seeing 40 as having the shape of the top part of the key. For now, at least. Ask me tomorrow, etc. How about some related images for this one regarding “Trap” being spelled out on the wall. It would be nice to see if we all agree. For me, the T is near the top on the left, upside down, and next to it is the P, lying on its back. Midway, to the left of the arrows, is the A, upside down. The R is on the right, next to the circle with the dot in it, lying on its front. Changing the subject, if you google alchemy symbols, there are a lot that are quite close to, but not exactly like, the symbols on this page. Interesting stuff. Apparently, my last comment on this room was misunderstood. The text code reads 8 and 2. So, the answer is either 16 or 4. The clues are “a passage in the rock” and ” he couldn’t read ( the symbols) correctly.” The symbols are T,R,A,P, and 4. 4 is the answer as it leads out of the trap. The door is small but it is definitely there in the lower right corner. I can’t believe I could be the first to find this part. I also disbelieve that you have found a door to Room 4 here that no one has found before. There is no door to 4. That door comes from 29. Please learn the basic things that we have solid knowledge of first then maybe your comments will start making sense to someone besides you. I don’t know, it’s quite possible to know a heck of a lot about Maze and still say stuff that makes no sense to anybody else. Really, to confirm what has been said, the door comes from 29 but cannot be entered from this side. The smallest door goes with a four in the wall inscription. Pretty easy to see. The smallest door comes from room 29, as confirmed by room mapping. Non-numbered doors are impassible as confirmed in the instructions. You may wish to dispense with phrases like “pretty easy to see” since all but one of your proposed solutions have been incorrect. Do not be discouraged, this is not unusual, it takes many misses to get a hit. The code on the wall can be read as follows: Count the number of pen strokes per symbol and then try to match this up to room numbers. Many rooms have an obvious word or phrase value associated with them, and in this way you can start building a message. One clue to do it this way is that one of the guests says the symbols appear to be primitive “signs”. If we interpret that to me numerical room signs, then we have a clue. Big walls: I measure man against/by a soul’s path in life. It’s true path will strike man(one) at last. Keep believing in yourself. First small wall: connection symbol – room 45. (Some souls will live in the world). Last wall: Answer = World and/or Man = answer. The farthest wall has “3″ “=” “earth”. If we read room 3 as “man” and note it is an “answer” then we get “answer = earth” which is answer to riddle of maze. but – if we read “earth” as “answer” and keep “man” then we get “man = answer” which fits in with the set of values noted in room 2. “Humanism”. Regarding the Tree of Life, room 40 is one of the nodes or “sephira” on the central branch. These rooms feature language relating to choices or decision. There is a somewhat muted reference here to choosing pretty much at random, which connects to room 4 which is also a center sephira. The choices can be seen as branches. This sephira is known as “Yesad” it means “foundation” and we can note that the text calls this the “foundation of the MAZE” it is also associated strongly associated with “truth” which is a word that appears on the wall a couple of times. The area ahead of us looks like one of vewatkin’s favorite things – A needle and eye. I would propose that it is symbolic that this is the “shaft” part of the key. Alternate reading of first small wall. The top symbol is just a connection symbol. The bottom two are 45. So nothing about poem here in that case. Just the second half of room 45 riddle. I think the 2nd big wall here is all encouragement. “That truth will strike man (one, you) at last. Keep believing in your self”. The first large wall is the real content. “I measure man by/against/with a “soul” truth. We really need to keep “soul” there, not “sole”. Then room 45 is close by on the first small wall with room 7, and the answer “the world” is on the last small wall. So I get, “In what house will one live? The world.” And that is the “soul” truth, that “one (a soul) will live in the world. So the final message is “A soul will live in the world”. This fits with room 11 where we are told to “LIVE” to escape the trap, and with room 6 where Raven can transport us between worlds. It fits with 19 too, but I need to publish that one. All of this has very little to do with the identity of the guide. Only that very first “water” symbol has anything to do with the identity. I read it as room 7 = Raven poem or just “poem” and 25 as “riddle”. The text mentions symbols for planets. There might be a symbol for Pluto, Roman god of the underworld. Pluto was still a planet when Manson wrote. Also, “Pluto” might be a small reference to the cat that runs through room 4, here in room 40. On the far right there is half of an “Earth” sign, which will be discussed below. The text mentions “hills” too, and I do believe there are “hills” there. The wind and water seem to be red herrings, and the guide does indicate he could read some of the symbols but not all. Look at the smallest grouping. We have 4 5 7. Room 4 would be “IT” and room 5 “roots” so this is unhelpful. And 57 can not be a room. Rooms 7 and 45 work nicely, however. 7=”poem/poetry”. 45 would then seem to be “Shakespeare”. Alternately room 7 = “Raven poem” and room 45 = “riddle”, and personally since I know where this is going, I like the 2nd one better. Let’s move to the bottom of the big wall. He have 3 and 4 = 34, and that is a pretty clear “I”. That circle with a line through it I take as 10. That room = “measure”. Next we have “3”, and that is “man”. The double headed arrow that crosses to the other wall took awhile, I could not make it work with room numbers, so I take it as a symbol. It clearly is relational and should be a preposition. I used “against” because it makes sense in the sentence and with the picture. The letter “A” is just “A”. The ballerina is a “soul” as in the room 10 puzzle and like the stick man in 3. Anchorperson noted we might have the ballerina here (and daughter Emily did shortly after, independently). Next we have a “T” and a “5”. T+root = troot = truth. The square is some sort of bridge or equal sign. Room 4 “it” would not fit. I used that word “that” as a bridge. Next we have “2 “big lines and “3” little. I finished tying together 23 but have not published it. We have all the pieces. “truth” (in the pictures) is the key word I have. Next the “P” and the other things near it are “hills” as the text suggested. We have a “V” nearby. V+hill = Vill which is “will” if you are doing a German accent. It is close enough for us to get the meaning clearly and/or you can grab another hill and make that “V” into a “W”. Next is “8”, room 8’s key word is “strike” but I need to publish that one still. Next “3” is “man” again. Then that can’t be another 8 since it would make no sense, but it can be a “6” with “2” hash marks = 26 = atlas. This is clarly “At last” in context, and if you want you can grab that arrow head for the “T”. Put it all together and you have “I measure man against a sole truth, that truth will strike man at last”. The star seems to be a “3” and the “R” a 4, and I get room 43, and it’s hopeful message of “Keep believing in yourself”. 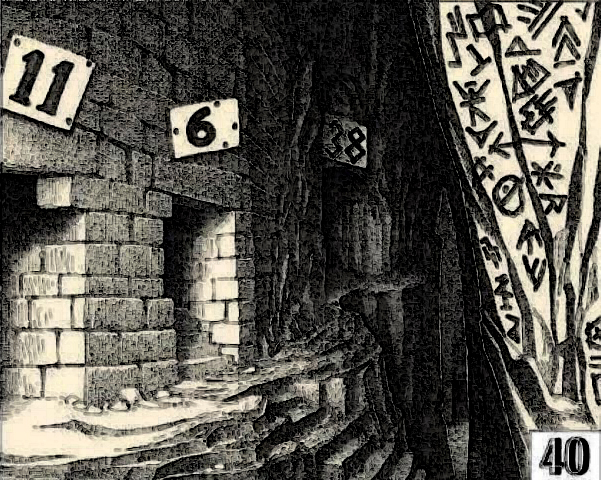 The final wall has a symbol meaning “earth”, then an “=” and then a “3”, and we know room 3 means “man”, but man is also the answer to the riddle in that room. Put this wall together and you have “Earth = answer to riddle”. I am suspicious of the part where you take a mock german impresison to be the key to getting this solution. I am also skeptical about virtually every other element of this proposal. This is incomplete. I’m looking at symbols on wall. Look at the smallest grouping. Let’s try counting pen strokes starting at the bottom. 4 5 7. Could be room numbers. The message of 7 I am fairly sure is poem. 45 has William Skakespere. I think the rest may tell us which poem. In the next group start at the bottom. 34. Then the round thing would be 10. “I” is what I get from room 34. 10 I don’t know enough about. But then you bring up ballerina there. at the base of the rock formation between 6 and 38, it looks like a person kneeling, or maybe a dog. Probably right about ballerina. Ill explain in a bit. The other may just be rock. 4 of 5 discovered I see. How about turn the page on its side and that odd looking 38 looks pretty darned unhappy. The text mentions symbols for planets. There might be a symbol for Pluto, Roman god of the underworld, but that is about it, except on the far right there is something that could be half of an “Earth” sign which would be a clue to the answer to the whole maze. Note: Pluto was a planet then. Janice collected this correct solution from the now defunct John Bailey site (posted by jmb184). Thank you Janice! Congratulations to Janice on noticing the arrow and to vewatkins for identifying it as part of a path. Bumping the solve meter up to five.